Pierre-Joseph Redouté (Born 1759 – Died 1840) was born at Saint-Hubert. 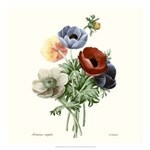 He was an engraver, illustrator and botanical artist. His father was a painter, and so were his two brothers. In 1772, having learned the much he could at home, Redouté set out to explore the Low Countries and Flanders with his paintbox. In the next ten years he earned an uncertain living as an itinerant artist, and in the process he studied the available old masters, and due to his hard work, managed to acquire a year of further training in an atelier at Liege. In Amsterdam, Redouté underwent something more or less like a conversion, by discovering the work of Jan van Huysum, and of some of the finest of the Dutch 18th-century flower painters. Meanwhile, his elder brother had become a designer of stage-set in Paris, and Redouté followed suit in 1782. 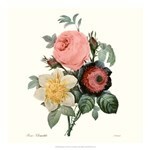 By then, however, his main interest was in botanical illustration. He loved art and said while he’s at it he felt like he was in his own little world - a world where nothing else mattered. His own little world was that of a realist; he created finely detailed paintings that they were and are often mistaken for photos. He began to frequent the Jardin des Plantes , where he met Charles Louis, a wealthy Linnaeus disciple, and profited from the encouragement of a Dutch water-colorist called Gerard van Spaendonck, who had become the professor of flower painting in the institution. Redouté was a unique artist with unique talent. His paintings are in many corporate and private collections around the world.